ServiceMaster Twin Cities in Little Rock, AR is your local commercial cleaning expert. Along with disinfecting electronics and washing your hands, improving indoor air quality in your office can impact your health. According to the EPA, “Americans, on average, spend approximately 90 percent of their time indoors,1 where the concentrations of some pollutants are often 2 to 5 times higher than typical outdoor concentrations.” In other words, indoor air quality is usually much worse than outdoor, and Americans spend the majority of their day indoors. Homes, schools and offices all struggle to ventilate fresh air. However, you probably have less control of that air quality in your office building than at home. 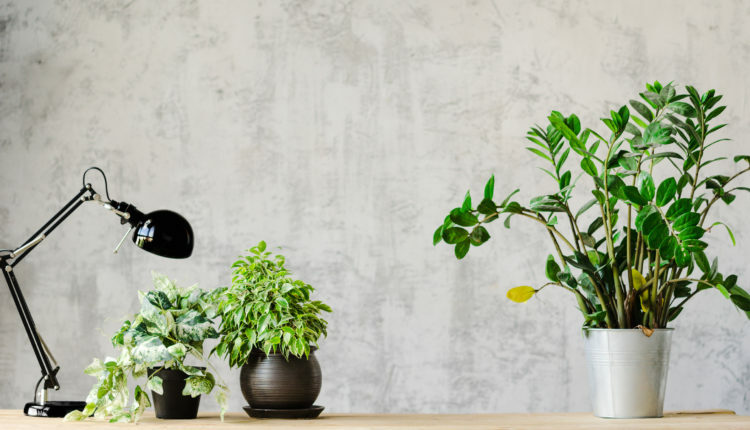 You might not be able to open windows or regulate air vent cleanings, but you can bring in a few plants to improve indoor air quality. Bamboo Palms are great indoors because they thrive in indirect sunlight. Keep them moist but avoid overwatering. Protect your Bamboo Palm from cold temperatures. These plants prefer 70-80 degrees. Bamboo Palms can grow as tall as 12 feet allowing it to filter more air. This plant can remove trichloroethylene, formaldehyde and benzene from your office air. Snake Plants are low maintenance. Consider it if you don’t have much time. You can leave it in bright or low lighting and go an extended period of time between watering. Snake Plants absorbs carbon monoxide, benzene, formaldehyde and more. It is one of the most oxygen producing indoor plants. Peace Lilies are a great option as an air filtering indoor plant, but it does produce pollen so be careful if you have allergies. It does well in shady areas. This plant removes toxins like ammonia, formaldehyde and benzene from the air. Just like Snake Plants, Spider Plants are a great low maintenance option. Only water this plant when needed about once per week. Spider Plants do well in low lighting and indirect sunlight. It can remove carbon monoxide, formaldehyde and xylene from the air. If your office is in a sunny part of the building, consider Aloe Vera. It’s a succulent so it doesn’t need much water. Aloe Vera is another plant that releases oxygen. English Ivy is versatile. You can plant it as ground cover, wall cover or put it in a pot indoors. From sun to shade, English Ivy does well in most environments. It removes harmful chemicals found indoors and some say it has antioxidant properties. Ficus plants do well in indirect sunlight. It needs to be watered frequently but don’t overwater. It can remove formaldehyde, xylene and toluene from your office air. Another plant that needs plenty of sunlight is Gerbera Daisies. Keep the soil moist but not overwatered. It effectively absorbs formaldehyde, benzene and trichloroethylene. ServiceMaster Twin Cities in Little Rock, AR has been providing commercial cleaning services for almost 30 years. Trust us to get the job done right in your office, educational or manufacturing facility. Contact us to find out more about our services.